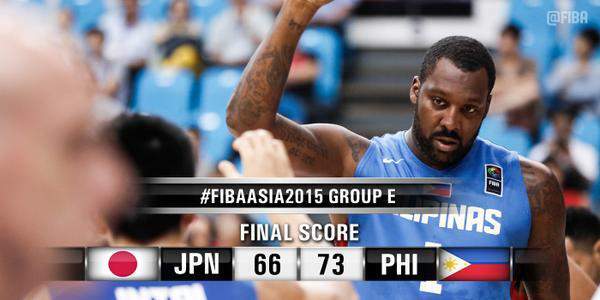 Video Highlights: Gilas Pilipinas beats Japan, 73-66, | #FIBAAsia2015 - Balita Boss! Watch the highlights of Japan v Philippines on day 4 at the 2015 FIBA Asia Championship (27. September 2015). Naturalized player Andray Blatche played through a painful ankle to help Philippines get the win against Japan, 73-66, in the second round of the 2015 FIBA Asia Championship on Sunday, September 27 in Changsha, Hunan, China. Blatche, the former NBA player, led Gilas Pilipinas with 18 points and 10 rebounds. Ranidel De Ocampo and Jayson William (Castro) contributed with 13 and 12 points, respectively. Team Philippines will go up against the reigning champion Iran on Monday, September 28 at 11:45 am.